Manufacturer & Exporter of Fabrication Services. Our product range also comprises of Scaffolding Clamps, Slab Shuttering Material and Shuttering material. Keeping track with the market development, we are engaged in providing our clients Fabrication Services. With the help of our team of adroit professionals, we render these services according to the exact needs of clients. Furthermore, we use advanced techniques and latest machines with high precision in order to execute these services. Service offered by us is highly demanded all across the nation due to their swiftness, reliability and flexibility. 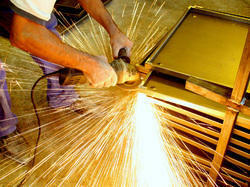 Looking for Fabrication Services ?